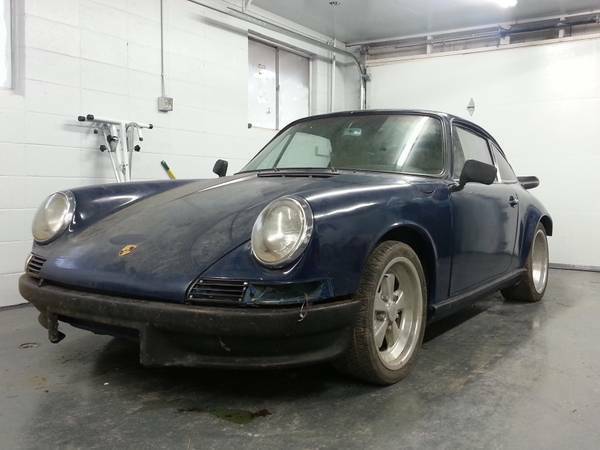 I never thought I'd see the day where a hacked up Porsche 912 offered for something less than $20k would be a good deal...but then I never thought that kids would snort cinnamon and listen to Nickelback, so there are a lot of things that I'll never understand, but need to accept. 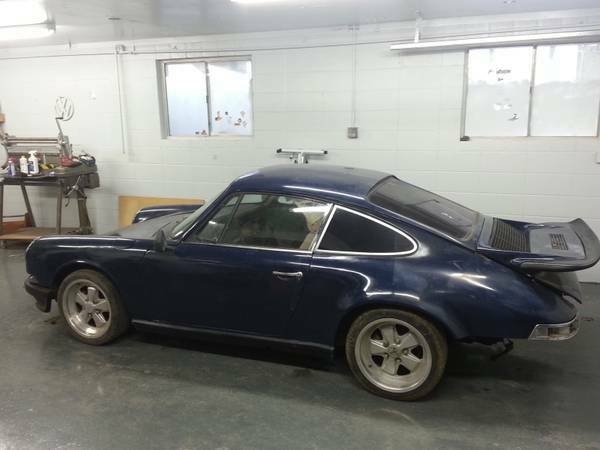 Find this 1966 Porsche 912 offered for $17,600 in Southern Oregon via craigslist. Tip from Kaibeezy. This isn't your typical rusted barn found 912 -- no indeed, someone went urban outlaw on this thing a few decades ago by (poorly according to the seller) respraying it a dark blue (from the factory original light ivory) and slapping on some fender flares and a whale tail to make it look more like an 80s 911 SC. 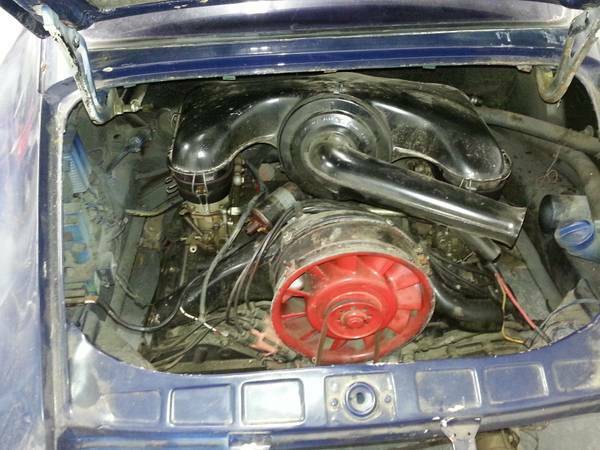 Out back is a 2.2 liter flat-6 from a 1970 911T -- if you could track down the original vehicle this engine came from, you could probably sell it to the 911 owner for the price of this car. The seller says: motor turns over and supposedly ran. 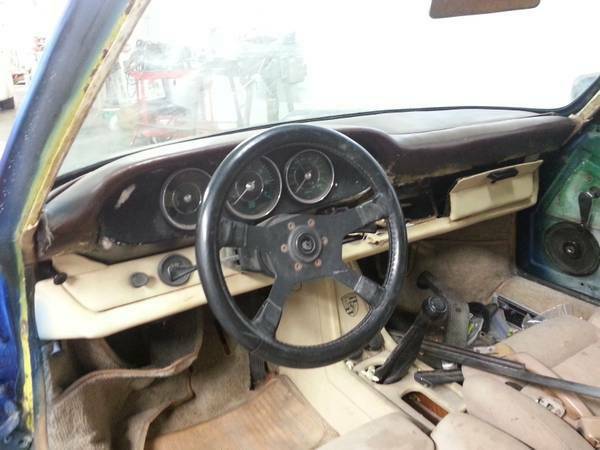 The interior is pretty ugly in the photos, but the real thing to do with this car isn't a restore it to stock, but to do your own poor man's version of a Magnus Walker urban outlaw on it. Just fix the mechanical bits, respray body panels different colors, add to racing stickers to cover the dents, and go bombing around sliding backwards into stationary trucks. I have to agree, it's not worth putting back to original condition. Maybe in a few years. I kind of like the idea of one of these or a 914 with hot flat four from a Baja bug or something. Um, so like did Magnus just FORGET that they parked that trailer there? And did he just FORGET that you can never lift off in a rear-engined Porsche? Anyway regarding this car, I am curious: is a 912 with a properly-done 911 engine transplant really any different from a 911? This is a serious question on my part. When "worth" and "value" no longer apply to the price of something, usually it is worthless, or inflated beyond comprehension. The 911 debauchery is pretty gross. I am grateful to have owned several very nice 356, 912 and 911's when they were merely cars, not affectations, nor an investment. Always thought I would have one again right about now. Let's see....a house or a Porsche? Tom, I missed my chance at owning a 911 before the values went cataclysmic, but I did get the chance to drive a few back when I worked at an independent Porsche shop as a summer job. The mechanics never had particularly nice things to say about those cars...except that you should get the newest 911 you could afford. I recall watching the prices go up when the dollar was weak (a decade ago) to the euro and people would export them...but the last 2-3 years have been just been nuts. Fair priced cars are now going for what concours cars were worth a decade ago. hagerty graph here. It will be curious to see if there is a correction, or if that is just the new norm for classic cars. I was chatting with a friend yesterday about how when we were younger the muscle cars we would build were pretty cheap. I am talking about in the mid 1990s. He had a 66 Nova with a Brodix 383 and I had a 68 Firebird 400 both built on Jiffy Lube job paychecks. We were wondering what we would be building if we were young guys today? Definitely not muscle cars, too expensive. I was saying how creative the Nissian 240sx and e30 guys are. Possibly Fox Body Mustangs? Maybe youngsters have more money now days. I don't know. I think the youngsters probably build mustaches, and take uber. In about 2002 I passed on a 1966 912 with a hot VW type 1 engine in it and was in running driving condition. $3500. Was missing bumpers, some trim, and a few interior parts. Fairly rust free. I thought it was overpriced.